This postcard arrived in the mail yesterday. It was sent to me anonymously from the “Valentine Goddess.” I do know that it came from someone in Key West because there’s been a flurry of them mentioned by my Key West friends on Facebook. I have a sneaking suspicion who the designer of the card is (this art has her “signature” all over it! ), but I get the impression from the comments on Facebook that it’s possible others may have been involved in the distribution of these wonderful Valentines. Ask not what Valentine’s Day can do for you, but what you can do for Valentine’s Day. To that I say: whoever took the time, effort and expense to send this lovely little Valentine’s message out to the world definitely asked themselves that question – what can I do for Valentine’s Day? They certainly came up with a great idea and deserve an enormous hug of appreciation. 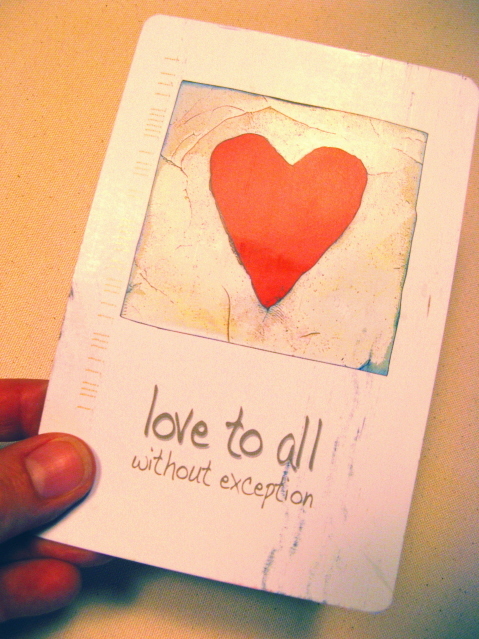 We can always use a little more love – without exception!